July’s Vegan Cuts Beauty Box arrived on time as usual, but slow blogger is slow. I wasn’t entirely impressed with this one since it was a little off the mark for the kinds of products I like (I find natural deodorants completely ineffective and don’t take baths, so..), but there were enough keepers to make the box worth it in the end. Moon Souls Lunar Soak – 4 oz / $11.95 – (Product is full size) The soak is salt based, scented with mint and eucalyptus, two of my least favorite scents, so this is an automatic pass for me. I can’t stand eucalyptus (it smells like those gross cough drops that make my stomach turn) and mint is a nope too. I don’t terribly enjoy soaking in a bathtub with my dead skin cells and dirt anyway, so this just wasn’t a good fit from scent to product type. Green Tidings Lavender Deodorant – 1 oz / $7.99 – (Product is full size) The scent is nice, but I’m not even going to bother wasting time on yet another natural deodorant with the same ingredients when none of them have worked long enough to be worth using. I mean, what’s the point of a deodorant that lasts maybe a maximum of 4 hours before needing to be reapplied if you’re routinely out of the house for 8+ hours at a clip?! I can’t exactly be taking breaks to go reapply deodorant in the middle of photographing a wedding, and being stinky while working isn’t an option. Hard pass for me. 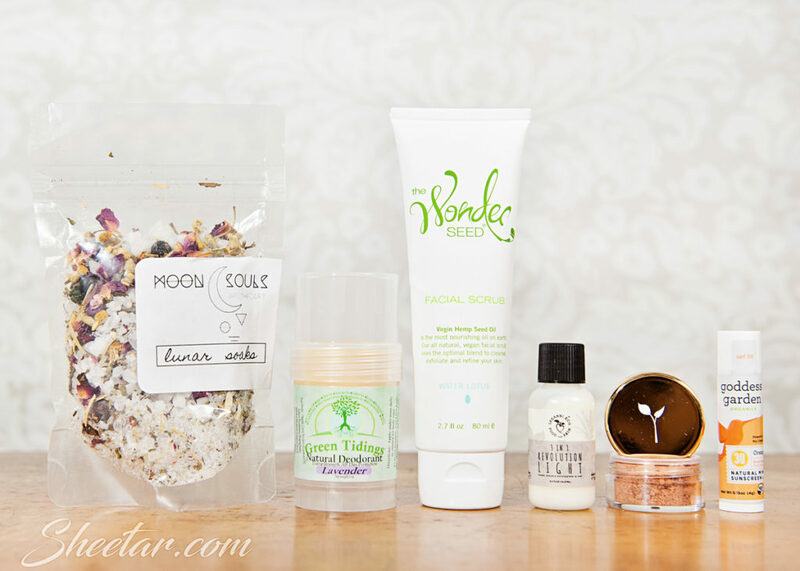 The Wonder Seed Facial Scrub – 2.7 oz / $14.95 – (Product is full size) I love a good scrub! The ingredient list on this is really amazing too. The scrub doesn’t foam up, but works into a creamy base that has a good, coarse salt in it to scrub. After rinsing, my skin felt moisturized instead of dry and tight, so that was pretty awesome. The scent isn’t overwhelming either – light and clean. Leeanni Eco 3 in 1 Revolution Light – 4 oz / $29.98 – (Product is .5 oz, value of $3.75) This is a moisturizer, toner, and serum all in one and can even be used to remove makeup. It feels rather weightless on and would be a great daytime moisturizer. There’s no discernible scent, and it did make my skin feel soft. Terre Mere Mineral Bronzer – 9 g / $54 – (Product is 2.5 g, value of $15) The color sent in the box is “Sunstone” which comes out as a more orangey tone on my skin. It’s also got a shimmer to it, so this is never something I’d use as a bronzer since sparkly skin isn’t my thing. It will make a great eyeshadow color though, and it’s super pigmented, but I couldn’t see using this as a bronzer without feeling like a glitter bomb went off on my face. Goddess Garden Sunscreen Lip Balm – .15 oz / $3.99 – (Product is full size) The scent is “Orange Vanilla” but there’s really not much of a scent at all, at least not to me anyway. Still, a lip balm with a physical blocker instead of a chemical blocker is awesome and something I’ll definitely use! Overall, the value of the box value comes to $57.63 which is great for a box that costs $22.95 on a month-to-month basis! Even without the two products I’m passing on, the box cost is still covered. I do love this box for the most part, but am definitely not into natural deodorants or bath salts/soaks. They did add a note that the bath soak can be put in a muslin bag in the shower and used as a steam bag at your feet or hung from the shower head, but I found the scent so unpleasant that I wouldn’t use it anyway. Oh well, one of my friends will love it, I’m sure!